PARK RIDGE, IL – The landmark 76 year-old Pickwick Theatre in Park Ridge, which is a symbol of this Chicago suburb, is finding itself in the midst of a struggle between the City of Park Ridge, its owners, the Vlahakis family, and the Pickwick Theatre Council, according to the Mount Prospect Journal. The Art Deco-style former vaudeville house (and one of the largest movie palaces in the Chicago suburbs) needs extensive repairs and renovations according to Pickwick Theatre Council president Catherine Kenney. City officials want to inspect the theater to verify its needs for upgrades and repairs, but cannot legally enter the building without the owner’s approval. The relationship between all three parties has been called “adversarial” by city council members. What is the source of this story? It does not appear to be from a news agency. Please clarify and cite your sources in the future. Personally, I do not see what value these comments have without comment from the owners. Overall, the Pickwick appears to operating quite well. It is strange to me to hear people complaining about “discount priced movies” in a historic theatre! What, precisely, is the alleged struggle? Well-intentioned individuals or groups with or without a vested interested (and/or expertise) may have grand ideas for any given theatre. However, why take issue and “poke the bear” of an apparently successful, open, operating theatre? The story originated in the Mount Prospect Journal, as cited in the first paragraph of this article. As with the rest of the stories we publish on Cinema Treasures, you may view the original article in its entirety by clicking on the link that appears in the attribution. If you feel this story is one-sided, we recommend you contact Mount Prospect Journal directly. Sorry to miss that. I guess I am used to seeing a link to the news source/article at the bottom or somesuch. And, yes, the story does seem vague, one-sided and rather pointless. I will pen a note to Mount Prospect Journal. You do see where I am coming from? Speaking from personal experience, I have found the owners to be: a) open to theatre and organ enthusiast events, b) open to public tours, c) cooperative with journalists, d) decent landlords, and e) enduring operators in times when the community would rather have had a mall or housing in its place. The aforementioned adversaries might do well to learn how to become advocates and boosters until such time they own the building and have operated it profitably for a couple decades before they speak out of turn. Why is Park Ridge trying to tell a private enterprise how to run its business? But then, Park Ridge has a history of infringing on personal property rights. It’s a very facist government there. The city’s mentality is that it owns your house or business. They even have an “Appearance Commission.” How enlightened they are. In the words of Paul Harvey, the REST of the story is what I should have read before commenting. It is one of the most famous building landmarks in the Chicago area, and the single most prominent structure in the City of Park Ridge. It is an official historical landmark, through the efforts of hundreds of Park Ridgeans and others who value its 1920s art deco architecture and its attractive, unique interior furnishings. It is reportedly in need of extensive repair and renovation, according to some reportedly knowledgeable persons. Its owners say the theater business is booming and that the building is in “great” condition. It is the center of a growing controversy that involves the Vlahakis family that owns the property, the city, and the Pickwick Theatre Council. A divided city council voted 9-5 Monday night (Apr. 5) to donate $10,000 in city funds to the council, but it is unclear if the funding will have any kind of positive impact on the theatre’s preservation or future." Complicating matters is that the city, which wants to inspect the theater to determine its physical condition and need for upgrades and repair, was advised by Attorney Everette Hill Monday night that it cannot legally enter the theatre property without the consent of owner Dino Vlahakis and his family. A five-member Park Ridge Pickwick Theatre Property Committee was formed by aldermen Monday night to pursue the possibility of inspecting the theatre and possibly developing some cost estimates for renovation work. It includes Ald. Donald Crampton as chairman along with Ald. Mark Anderson and Mayor Michael S. MaRous. Plus Thomas Brady, a local architect who reportedly has historical preservation credentials, and Aurora Bella-Autriaco, a new member of the city’s Appearance Commission, which deals with the architecture and appearance of all structures in the community. Voting against the $10,000 donation Monday night were Ald. Howard Frimark, Andrea Bateman, Sue Beaumont, Larry Friel, and Rich DiPietro. Most of them said they did so not out of any criticism of the Theatre Council or lack of funds, but because of the “adversarial relationship” between the Theatre group and the owners. Shedding some light on that relationship Tuesday for the Journal was Catherine Kenney, Pickwick Theatre Council president. “Yes, we are adversaries,” she said. “The owners regard the Pickwick as a piece of real estate. We regard it as a valuable historical landmark that needs a lot of repair and upgrade, and as a marvelous place for live theatre events. She said the owners have withdrawn from the council and its activities, and the council does not have access to the theatre itself for the purpose of planning activities. Disputing this in a letter to Mayor MaRous on Mar. 30 were the Vlahakis and Loomos families, owners. “The Pickwick building and Theatre are not for sale,” they said. “We are currently running a very successful business and envision many successful years to come. Last year, over 200,000 people attended movies and special events here. In the 23 years we’ve owned and operated the theatre, the last three have been our best movie years ever (thanks to movies like ‘My Big Fat Greek Wedding’‘). The city is especially interested in its future because of the Uptown redevelopment that is planned to take place across Prospect Avenue from the theatre beginning later this year. It looked to me last summer when I attended a G-FEST related screening that work was being done on the theater. This is a fine theater and if properly restored, will be even greater! 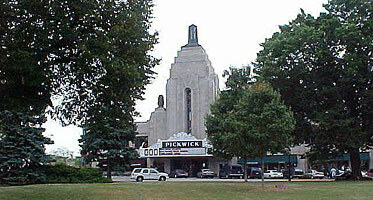 I am looking forward to going to the Pickwick this July during G-FEST XI! LEAVE THEM ALONE. WHY DOES EVERYONE WANT TO BUILD COOKIE CUTTER BUILDINGS EVERYWHERE ? LET THESE THEATRES WITH CHARACTER BREATHE !